A crew of surveyors with a string of horses, some mules and three packed camels started on their trip across the Mojave Desert to the Colorado River. Incessant rain and swollen rivers had kept the party camped near Los Angeles for some weeks. According to one observer, “they’re a hard looking bunch hired by President Buchanan to survey part of the eastern boundary of California” – the year 1860. A few weeks earlier another party of surveyors had chartered a steamboat near Fort Yuma that took them up the River to 35 degrees of latitude where they reset a survey monument that had been set in 1856 by Lt. Joseph Christmas Ives. The eastern boundary had been agreed to in principle but had not been officially approved by the state law makers in Sacramento. The agreed-on-but-unapproved line followed south along the 120th meridian from the southern border of Oregon to the 39th parallel north latitude from where it struck a southeasterly direction to the 35th parallel north latitude at the Colorado River. From there, the River becomes the boundary south to the Mexican border. Except for resetting a survey monument at the Colorado River, the expedition did little to help locate the eastern boundary. It did, however, give notice to the successful use of the camel as a pack carrier in the desert. A survey in 1855 gave California some bad news. The transit point for the line (120th meridian at the 39 degree latitude) was located in Lake Tahoe. Therefore, the starting point for the oblique line running southeast would have to be placed on the southern shoreline. A survey party would then use that critical shoreline point to set their course across 400 plus miles of unexplored desert in hopes that their line would close near Lt. Ives’ survey monument at the River. After reaching the River the party would return to the Lake to adjust the line and set markers as prescribed in their contract. The Carson Valley silver discoveries brought miners, prospectors and camp followers to the western edge of Utah Territory. It wasn’t long until valley settlers made it known that they didn’t want to be governed from Salt Lake City. Given that the country needed the mineral riches coming from the mines to help pay for the Civil War, Congress passed legislation creating the Territory of Nevada with a governor and state-like status. The boundary line between the two states then became an issue and problems began to form some with serious intentions -- one in particular. The Honey Lake region, located on the eastern slope of the Sierra Nevada Range, became the scene of a local battle among its citizens referred to by some as the “Sagebrush War”. It started with a number of suspicious political maneuvers and some back and forth jostling. Then it escalated when those who fancied themselves to be citizens of the Territory of Nevada, arrested the sheriff and judge of Plumas County, California and held them captive. Expecting that there’d be trouble over this action, an armed group of men from Toadtown arrived on the outskirts of Susanville and occupied an old abandoned fort. Upon learning of the arrests, the outraged Californians of Susanville gathered up their weapons and took cover in a barn located a short distance from the fort. The battle commenced when a wild shot was fired. More wild exchanges, intended mainly to make noise and avoid injuries, followed and continued through the afternoon. Notes were passed back and forth between the camps and finally a cease fire was accepted by the two sides and all joined up at the Cutler Arnold Hotel for dinner where they traded stories about their part in the afternoon drama. The next morning, having had their fill of battle, the sides agreed to let their respective governors settle the boundary issue. To everyone’s relief, the fight caused no deaths or serious injuries. The two governors agreed to finance a survey that would follow the boundary as described above. The surveyors general of California and Nevada drew papers and awarded a contract to John F. Kidder to survey the 800 mile line from the Oregon border to the Colorado River. Kidder’s team started at the north end of Lake Tahoe and surveyed a line north along what Kidder assumed to be the 120th meridian. Upon completing this line, a post was set on the Oregon border and the team returned to the Lake to start on the 400 mile oblique boundary to the Colorado River. The mining town of Aurora was so near the state boundary that, in the election of 1863, voters could vote in the morning on the Mono County, California ballot and in the afternoon cast a vote in Esmeralda County, Nevada. In fact, some local politicians held elective offices in both states. As the survey crew drew near, bets were laid on which side of the line the town would fall. Those who bet on Nevada won. Some distance from Aurora, Kidder and his team approached a gathering of 500 Indians representing a number of tribes holding their annual pine nut celebration on the line where the survey was to run. After discussing the problem with tribal leaders, it became clear that the natives had no intension of ending their merriment soon. The weather was changing as blizzard conditions developed in the high country and the team was getting short of funds. Given these facts, a decision was made to pack their instruments and head back to Sacramento. Kidder submitted his report with a request for additional funds to continue the survey in the spring. His report was accepted but his request for additional funds was denied and so, the boundary ended 100 miles south of Lake Tahoe. The line between Lake Tahoe and Oregon gained acceptance and became know as the “Houghton-Ives Survey of 1863,” named for the two surveyors general, H.F. Houghton of California and Butler Ives of Nevada (This Ives is not to be confused with Lt. Joseph Christmas Ives who set the monument at the river). The survey was officially approved by both states. However 300 miles of the oblique line to the Colorado River would remain un-surveyed for the next ten years. A survey of the Oregon’s southern boundary, in 1867 by D.G. Major, found the 120th meridian to be two miles west of the Houghton-Ives post. That was pleasing news to Nevada; however, the U.S. General Land Office (GLO) decided that it was time to settle the boundary mess once and for all. Allexey W. Von Schmidt, a practicing engineer and surveyor, joined the gold rush to California along with many of his countrymen. After scouting along the foothill placers, he decided he could make more money plying his trade than sluicing for elusive gold and took work with the U.S. government conducting land surveys in the Owens Valley. As a reward for his good service he was give the contract for the full 800 mile line from Oregon to the River with the proviso that the survey start on the Oregon border at the post set by D.G. Major and referred to as the “initial point”. For whatever reason, Von Schmidt started his flagged line from a point near Lake Tahoe rather than on the Oregon Border as instructed. At Smoky Creek, about half way up, he received word from the GLO that if he decided to survey from the south he better make sure that the line arrived at Major’s “initial point”. In other words, the 120th meridian as set by Major will not be changed. 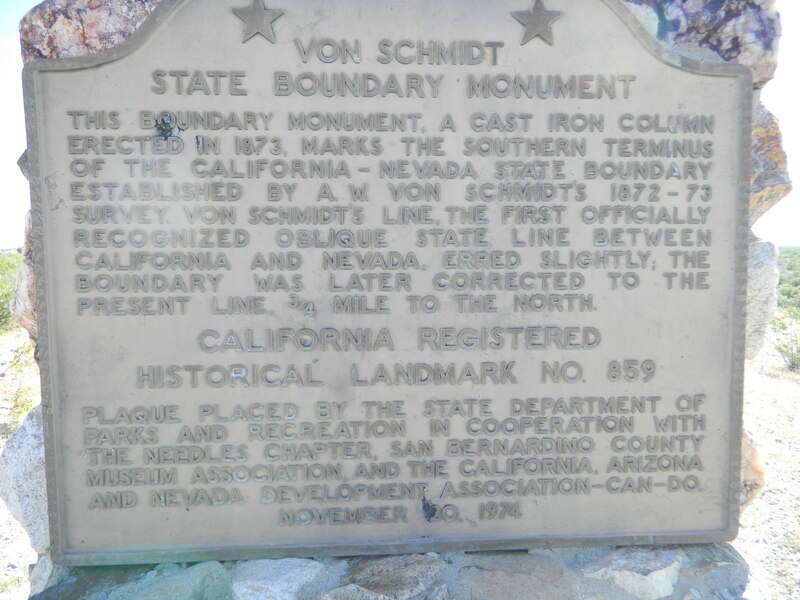 Well, Von Schmidt saw the problem that he had created, left his flagged line and hurried north to the Oregon border and found Major’s marker. With compass pointing south, the team began to mark a new line to Lake Tahoe. When they arrived back at Smoky Creek, they found their flagged line, coming up from the Lake, to be located 3 ¼ miles to the east. Now, if Von Schmidt had ignored this discrepancy and simply continued on, he would have met the terms of his contact -- but no. Von Schmidt decided that his flagged line was the true meridian so back he went to the Oregon border, for the second time, measured 3 ¼ miles from Major’s initial point and set his post. He now determined to complete his survey, remove evidence of the other line, and mark his boundary every mile back to the point where he started at Lake Tahoe. This line with all of its kinks and questionable origins became the unofficial boundary line north of Lake Tahoe and is still in effect. By the time the party got back to Tahoe, the season was closing on winter so the southeasterly boundary line would have to wait until spring. The longitude of Lt. Ives marker at the Colorado River was used by Von Schmidt to determine the direction to follow from the south end of the lake. The party headed generally southeast across desolate dry country that had no sign of human endeavor. Upon reaching Lt. Ives’ marker they found that the Colorado River had changed course and fiendishly move 1½ miles to the east: meaning that the boundary line would have to be moved east that distance at the river then adjusted proportionately all the way back to Lake Tahoe. Von Schmidt ran out of money about a third of the way back to the lake and abruptly ended his work. He didn’t report the fact that the adjustment had not been completed and that’s why, on old maps, there’s a hitch in his line at the south end of Mesquite Valley in California. To the north of the hitch, his line crosses the official boundary at the north end of Mesquite Dry Lake and continues on in Nevada to Lake Tahoe. Some suspected that the Von Schmidt oblique line from Lake Tahoe to the Colorado River was neither accurate nor straight. In 1893, the U.S. Coast and Geodetic Survey began surveying the oblique line using a more advanced approach for finding the end points and for scaling a straight line between them. This survey line was adopted by California in 1901 and Nevada in 1903. In 1980, the U.S Supreme Court ruled, in California v. Nevada, that because the Von Schmidt line between the Oregon Border and Lake Tahoe had become generally accepted by both states and even though it is not exactly on the 120th meridian, that it would remain the official boundary. And further, because of its greater accuracy, the U.S. Coast and Geodetic Survey line would be the official boundary between Lake Tahoe and the Colorado River. 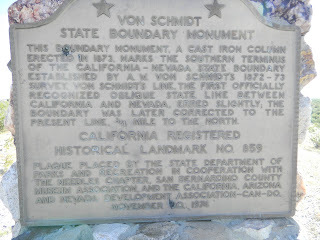 I recently visited the Von Schmidt monument at the Colorado River (Photograph above). It’s located about eight miles north of I-40 on the east side of River Road. Watch your GPS and when you start approaching 35 degrees north latitude look to the east. At sometime in the 1880s, W.H. Salisbury found Von Schmidt’s iron monument lying below the bank where it had been undercut by flood waters. With the aid of some Mojave Indians and his team of horses, he pulled it back up on to the bank and placed it where it sits today.